"We are gases", a voice utters, and the earth is desert, is paved, is rumbled, is active. 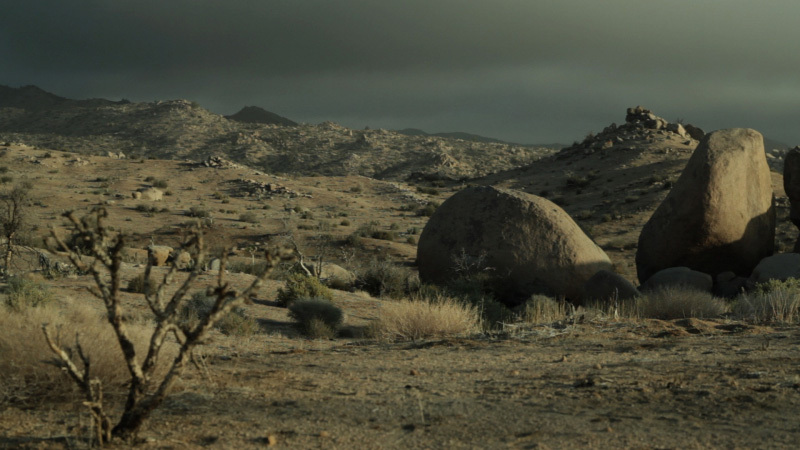 Following these words, images and the related notions of esoterism, science fiction, economics and natural science, The Otolith Group’s "notebook film" "Medium Earth" traces the faults in the ground, the cracks in the concrete and the relentless vibrations in the Californian landscape to imagine a seismic subconscious of the Earth. In doing so, the film engages as a medium through which the Earth speaks, as well as the Earth is reflected on as a medium expressing its invisible and hidden forces in a non-human and ecological language in sound and movement. The Otolith Group, founded in 2001 by Anjalika Sagar and Kodwo Eshun, is engaged in the histories and potentials of science fiction and tricontinentalism, a politically accentuated version of postcolonialism. Amongst others, their works have been shown at: 2014 In the Year of the Quiet Sun, Casco, Utrecht; The Anthropocene Project, Haus der Kulturen der Welt, Berlin; 2013 Medium Earth, REDCAT, Los Angeles; ECM: A Cultural Archaeology, Haus der Kunst, Munich; 2012 dOCUMENTA (13), Kassel. In 2010 The Otolith Group was nominated for the Turner Prize.